This is my very first NYX haul! I was so excited to try these lippies out when I got them. 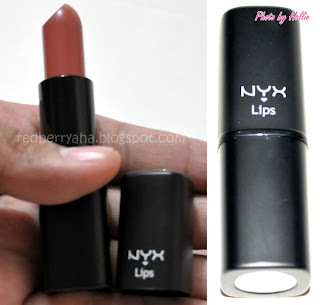 I originally ordered 6 NYX lippies but forgot to take a picture of the other one (it's in a separate image below). Here they are! 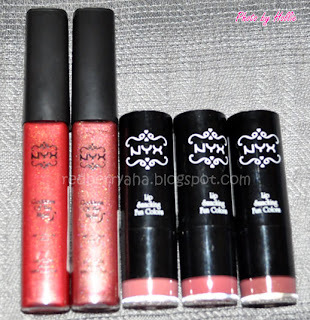 From the left: NYX Megashine Lipgloss in Sunrise, Megashine Lipgloss in Silver Plum, NYX Round lipstick in Tea Rose, Doll and Topaz. 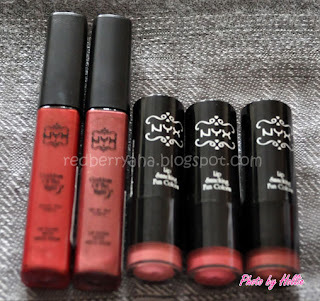 I finally got my hands on some NYX lippies! yeepee! It's definitely love at first swipe...lol. I bought these on sale from an online seller CareFreeShopper for only Php 160.00 each. Shipment arrived after 2 days via Air 21. It was a really smooth transaction, since her website is very detailed, it includes info on payment options (she accepts paypal) and shipping options. * the colors don't stay long, it started to fade after 2 hours but I don't really mind reapplying. I'm very impressed with these, I would highly recommend them. I wanna buy some too!! !